New York, a small town on the tip of Manhattan island, 1746. One rainy evening in November, a handsome young stranger fresh off the boat pitches up at a counting-house door in Golden Hill Street: this is Mr Smith, amiable, charming, yet strangely determined to keep suspicion simmering. For in his pocket, he has what seems to be an order for a thousand pounds, a huge amount, and he won’t explain why, or where he comes from, or what he can be planning to do in the colonies that requires so much money. Should the New York merchants trust him? Should they risk their credit and refuse to pay? Should they befriend him, seduce him, arrest him; maybe even kill him? An astonishing first novel, as stuffed with incident as a whole shelf of conventional fiction, Golden Hill is both a book about the eighteenth century, and itself a novel cranked back to the form’s eighteenth century beginnings, when anything could happen on the page, and usually did, and a hero was not a hero unless he ran the frequent risk of being hanged. 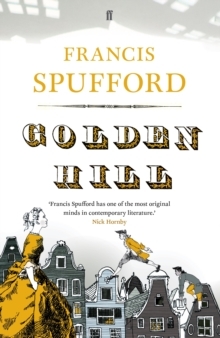 Rich in language and historical perception, yet compulsively readable, Golden Hill has a plot that twists in every chapter, and a puzzle at its heart that won’t let go till the last paragraph of the last page. Set a generation before the American Revolution, it paints an irresistible picture of a New York provokingly different from its later self: but subtly shadowed by the great city to come, and already entirely a place where a young man with a fast tongue can invent himself afresh, fall in love – and find a world of trouble.